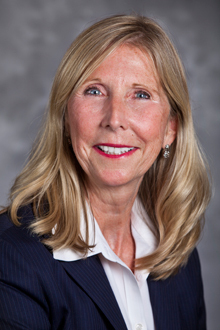 Carol Dillon Kissal joins Emory as the new vice president for finance/chief finance officer. Carol Dillon Kissal has been named vice president for finance/chief finance officer, succeeding Edie Murphree and reporting to Michael J. Mandl, executive vice president, business and administration. "Carol's appointment is a component of Emory's multi-part and multi-year financial leadership succession plan," says Mandl. Kissal was selected after a national search that included strong input from a broad group of Emory faculty, staff, deans and business officers, and an extensive review and diligence process. Kissal joins Mike Andrechak, Emory's chief university budget officer, who was appointed by Provost Claire Sterk in May. Kissal and Andrechak will work in tandem leading Emory's finance and budget functions and supporting Executive Vice Presidents Mandl, Wright Caughman and Sterk. "Carol stands out as someone who has finance and capital market experience, a keen intellect, a deep understanding of complex organizations and a track record of successful leadership. To lead in a mission-driven enterprise with deeply established values, we identified a professional who possesses a rare combination of skills and characteristics including financial acumen, capital markets experience, integrity, superb communication skills, professional temperament and a record of accomplishing important work in organizations characterized by deep complexity," Mandl says. "We sought a leader who could engage thoughtfully with our diverse community, listen astutely, and communicate clearly with faculty, staff and trustees. We found that person in Carol Kissal," he continues. Kissal demonstrated these attributes during her five-plus years as chief financial officer at the Washington Metropolitan Area Transit Authority (WMATA), an organization with a $2.5 billion operating budget and $10 billion in assets, where she served until her resignation in April. While at WMATA, Kissal worked collaboratively and gained the support of colleagues, the CEO and board of directors to significantly improve the organization during her tenure. Under challenging circumstances, she led comprehensive multi-year initiatives to deal with the impact of the global economic crisis, modernize technology and develop staff in order to increase the performance level of a highly regulated and politically scrutinized enterprise over a multi-year period. Although a financial review conducted by the Federal Transit Administration (FTA) found weaknesses in adherence to procurement, control and process rules associated with FTA grants during her tenure, "Carol maintained the long-term view for WMATA's financial performance and operating standards, and made steady incremental improvements against significant headwinds," says Mandl. Kissal expressed her admiration for Emory and its faculty, physicians and staff throughout the search processes. "In my visits to campus, I very much enjoyed my interactions with faculty and staff. As part of familiarizing myself with the Emory community, I see it as an important early step to meet with many faculty and staff to get a deeper sense of their challenges and opportunities," she says. "It is important for me to develop an understanding and vision for how the finance division can be a collaborative partner in carrying out Emory's core mission," Kissal notes. Kathyrn Yount, chair of the Faculty Council and president of the University Senate, welcomes Kissal's arrival. "We look forward to working with Carol and appreciate her openness to engage with the Emory faculty," Yount says. Earlier in her career, Kissal served as treasurer of Amtrak. As Amtrak's treasurer, she helped to secure more than $2.2 billion in capital improvements for Amtrak, developed self-insurance property and liability programs, and managed debt and investment portfolios. Prior to WMATA, Kissal was the deputy director of the District of Columbia Department of Transportation and also directed the accounting and budget activities for the District of Columbia public school system, which has a $1 billion operating budget and a $10 billion capital budget. In addition to her experience in large not-for-profit organizations, Kissal also worked for several years in financial roles at IBM across the world. Kissal has a bachelor's of science degree in business management and a MBA in corporate finance. She will begin her new role at Emory in September.